Weatherly is committed to the production of what we call “Safe Copper”. 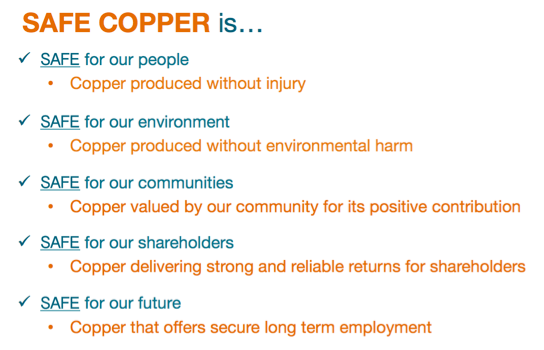 Our vision is to be known by everyone everywhere as “the Safe Copper company” – a team of great people, working according to our Safe Copper values to reliably deliver the Safe Copper results we promise. While safety of people in our workplaces is always of the utmost importance to us, Safe Copper is about much more than preventing workplace injuries. It is about managing all business risks well and thus reliably delivering benefits to all stakeholders. It is the means by which we aim to become (slightly) boring – consistently under-promising and over-delivering on all fronts, including shareholder return. 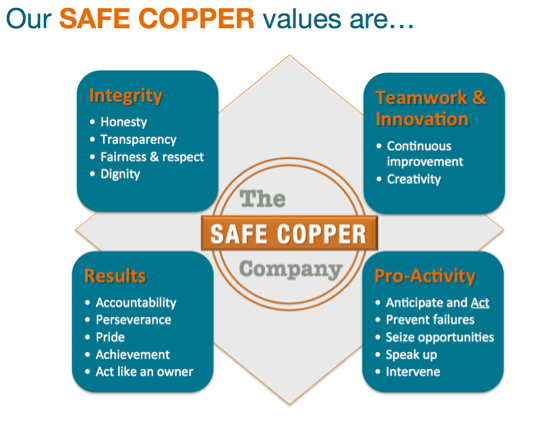 We use our Safe Copper values to define the required behaviours in the workplace, which are in turn used to drive delivery of the outcomes we require from the business as a whole. These values and behaviours assist us with management of all risks faced by the business. We fully recognise that positive management of safety, environment and social risks have concrete positive impacts on the performance of the business. We further believe that these same values and behaviours play an important direct role in helping our people manage the risks affecting delivery of the operational and commercial results we set out to achieve.